The thing in the sand was an eye. "Hey," said Jimmy to Karl, who was digging for clams in the sand. "Get over here. You've got to see this!" He pointed as a wave washed over his naked feet again. "Right here," he said. "I saw an eye. A real freakin' eye." "I kid you not. 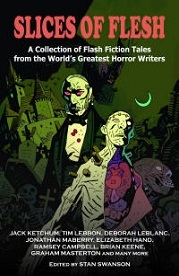 You will love the hell out of this collection of flash fiction. The Slices of Flesh stories have a tastel all their own and an originality of flavor you will not soon forget. You don't need a large steak knife and fork to dig in, just peel back the pages one by one and enjoy the written word. Every story in this anthology is top notch." "Do you like horror in bite-sized chunks? If so, then SLICES OF FLESH will activate your taste buds like zombies drawn to fresh brains. These flash fiction stories oozed from the brains of some of the best horror writers around the world and will fit perfectly into your daily diet of 'scary.'"